Save time when polishing and etching with the automatic, microprocesser-controlled LectroPol-5 electrolytic polishing machine. 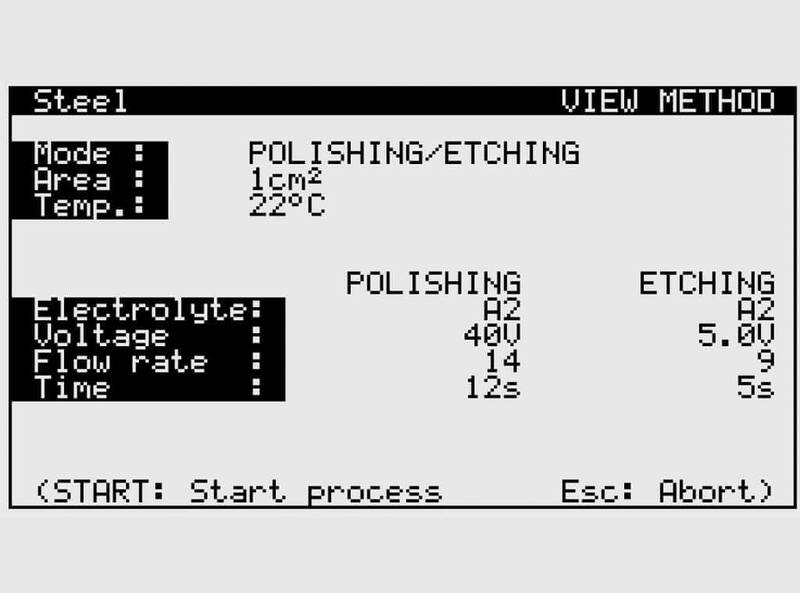 The LectroPol-5 is designed for automated electrolytic polishing and etching of metallographic specimens. 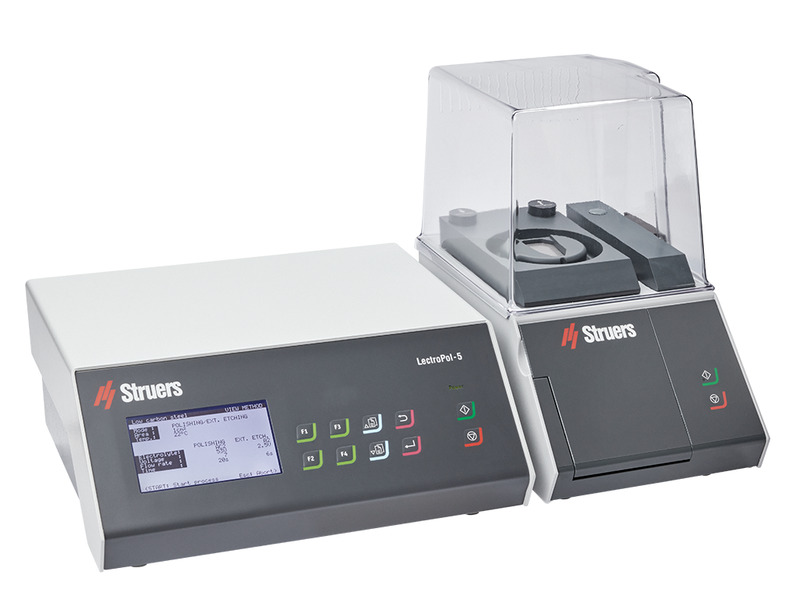 A scanning function for easy determination of parameters, built-in safety features, and a database with methods for various materials enables short polishing times and maximum reproducibility. LectroPol-5 consists of two units, the control unit and the polishing unit. The two units can be separated from each other. 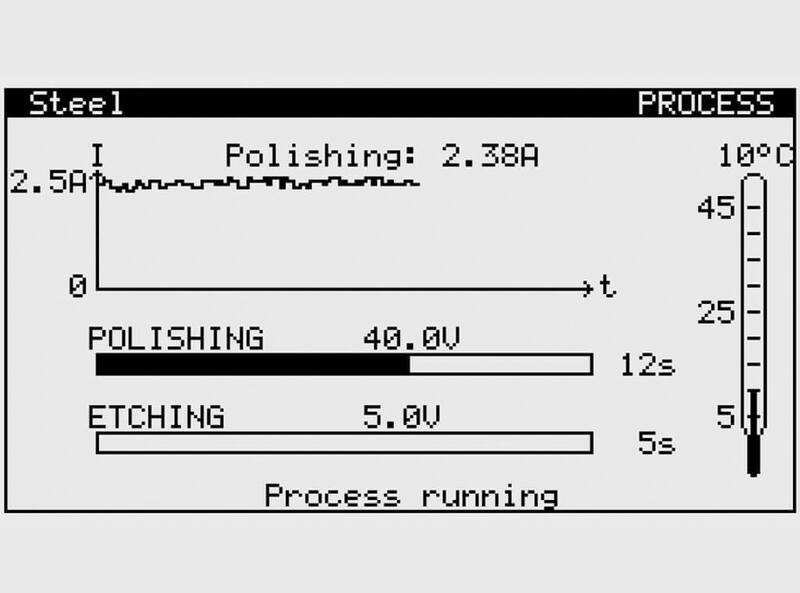 LectroPol-5 features a scanning function that helps to determine the correct voltage for both polishing and etching, thus saving time and avoiding human error. 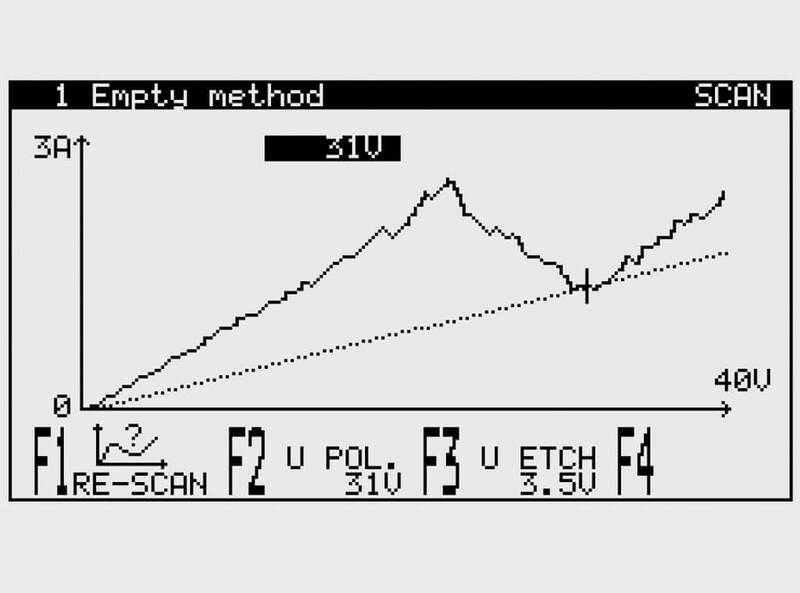 LectroPol-5 displays the scan curve, while the user selects and sets the voltage. Instead of time-consuming trial and error parameter testing, it is now easy to find the correct settings after a single scan of a new sample material. The LectroPol-5 comes with ten polishing/etching methods for various materials, enabling immediate preparation of a wide range of materials without any lengthy and time-consuming trials. These methods can also be used as starting points for the development of methods for other materials. The LectroPol-5 database can store 20 user-defined methods. Electrolytic polishing and etching have very short preparation times when compared with normal mechanical specimen preparation. Microprocessor control and database functions ensure the use of correct parameters. LectroPol- 5 combines both short preparation times and high reproducibility and is thus the ideal choice for fast quality control requirements. Both the power supply and the programming and monitoring functions are incorporated in the control unit. Easy touchpad operation combines with a back-lit graphic display of all parameters and monitoring of the process. The separate unit design enables the polishing unit to be placed away from the control unit in a fume cabinet, for example. The process can also be started directly from the polishing unit. The electrolyte is stored in easily exchangeable electrolyte containers that are inserted into the polishing unit. All functions are controlled using advanced software. An increase in the electrolyte temperature above a pre-defined limit will automatically result in either a warning or shut-down of the procedure in progress. Voltage and current are constantly monitored, and settings are automatically kept within the limits of Lectro-Pol-5. LectroPol-5 features a built-in measuring and control system that constantly monitors the electrolyte temperature. If the temperature exceeds the given limit, water is run through the cooling coil. If no water is connected, or the electrolyte temperature continues to rise, a warning is displayed, and the LectroPol-5 automatically shuts down. A special LectroPol polishing unit is used for this application. Stainless steel cooling coils are led directly to the back of the polishing unit where they can be connected to an external cooling unit. The external cooling unit takes over temperature control and regulation of the electrolyte, enabling materials to be polished at sub-zero temperatures. 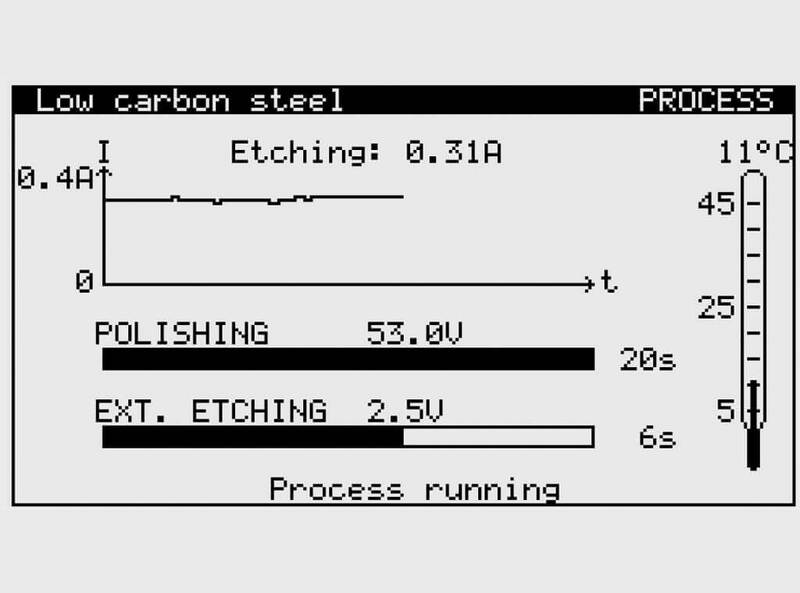 LectroPol-5 can also be used for external etching (controlled by a preset voltage exposure and polishing time). Fully automatic, microprocessor-controlled electrolytic polishing and etching apparatus. Complete with control unit, polishing unit, and external etching unit. One set of masks and two electrolyte containers are included.